Prima facie this looks a bold and surprising statement. Bold, because the foreseen increase is very large. Surprising, because the contribution to this increase from the outright purchases of Asset Backed Securities and Covered bonds, which are under the direct control of the European Central Bank, is unlikely to be very large. 2)See my previous post on Quantitative Easing by the ECB: Some unpleasant Quantitative Easing Arithmetic Just to quote a figure, I would be very surprised if these purchases would reach 20 per cent of the foreseen increase; 10 per cent or somewhat more looks to me like a more reasonable figure. So, the heavy lifting would have to be done from the Targeted Longer Term Refinancing Operations (TLTRO). This is indeed what Draghi said in previous press conferences, when he quoted a foreseen take of the TLTRO between 450 billions and 1 trillion 3)“On the TLTRO, we mentioned the figure of 7% of the loan book of banks amounting approximately to €400 billion, and the overall take-up could reach a maximum of €1 trillion” , Mario Draghi, Press Conference, July 2014. But a plan by the ECB to increase the size of its balance sheet by such a large amount largely by means of refinancing operations seems to be in contradiction with the fact that, since October 2008, when the ECB moved from fixed quantity-variable rate to fixed rate-variable quantity auctions, it is commercial banks that determine the amount of central bank liquidity: how can the ECB plan a huge increase of its balance sheet when this is dominated by decisions of the aggregate banking system? An explanation in 8 charts can help solve the riddle. 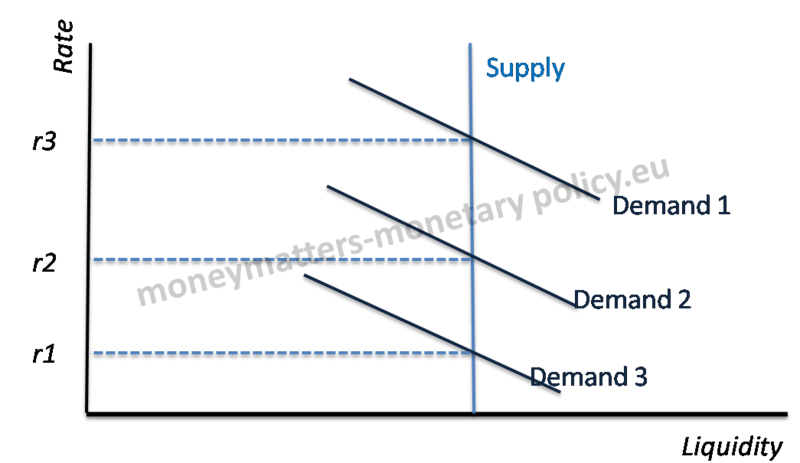 Before the beginning of the crisis the demand and supply of liquidity could be represented as follows in a price-quantity space. In the chart the supply of liquidity is fixed by the ECB and the behaviour of banks at the tenders determines the interest rate. Looking at Chart 1, one should infer that before the crisis there was a lot of variability of the market interest rate, in particular the overnight rate (EONIA). This was not the case, however, as it can be seen in the non-pink (pre-Lehman) part of Chart 2 and in particular until August 2007: EONIA was fairly stable around the rate on Main Refinancing Operations (MRO). The reason for this behaviour is that the ECB could foresee very precisely, until August 2007, the shift in demand of central bank liquidity by banks, which depended on autonomous factors and predetermined compulsory reserves, since there was practically no demand for excess liquidity. So, in practice, tender after tender, the ECB adapted the supply of liquidity according to its forecast of commercial bank demand, following the so called “benchmark” approach. 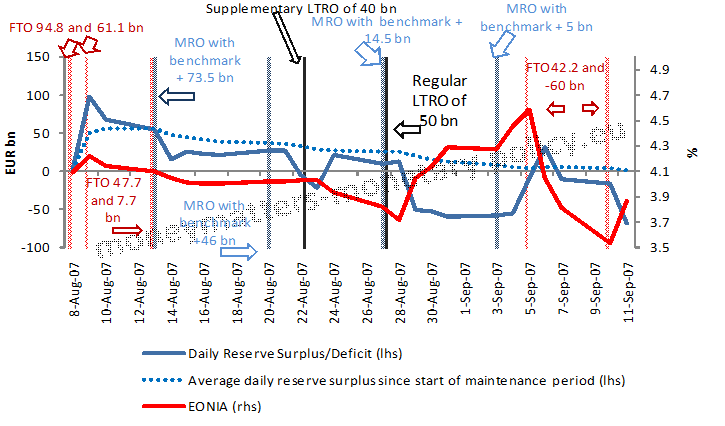 The stability of EONIA close to the MRO rate is even clearer in Chart 3, reporting the EONIA as well as excess liquidity during the July-August 2007 maintenance period, i.e. the last month before the beginning of the crisis: both variables were approximately constant, with excess liquidity practically at zero and EONIA very close to the MRO. This configuration of stability changed dramatically in August 2007, as can be seen in Chart 4. Average excess liquidity is positive until the end of the maintenance period. 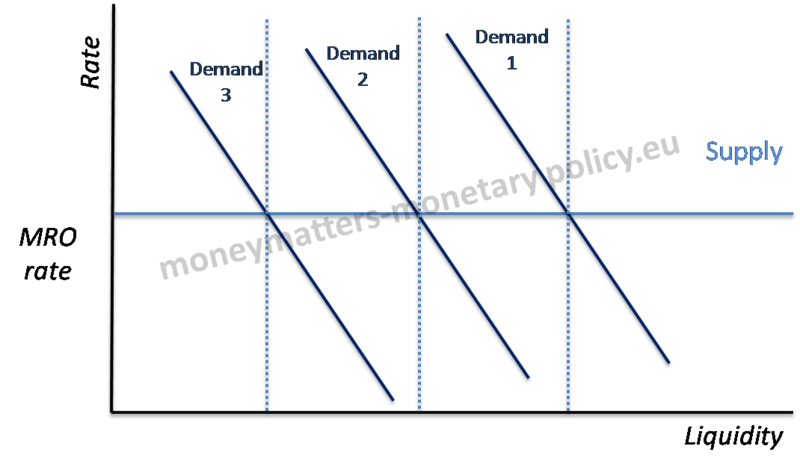 Chart 5 schematically represents the situation after October 2008, in which the rate at the ECB auctions was fixed at the MRO rate and the quantity of liquidity depended on shifts of demand by banks. The shift of liquidity demand by banks depended, in turn, from the degree of impairment of the money market: as the difficulty for banks, particularly in the periphery, to fund themselves in the market increased, they drew more liquidity from the ECB, when the tension lessened, they reduced their dependence on the ECB. Chart 6 reports the asset side of the ECB (indeed more precisely of the Eurosystem) balance sheet. According to the interpretation I just gave, the ups and downs in the request for funds from the ECB should depend on the intensity of the crisis. In the chart one sees that banks, during the crisis drew very abundant liquidity from the Longer Term Refinancing Operations (the blue area in the chart). The effects of this enhanced reliance on the ECB funding are clear if we look again at Chart 2, in particular at the pink part. 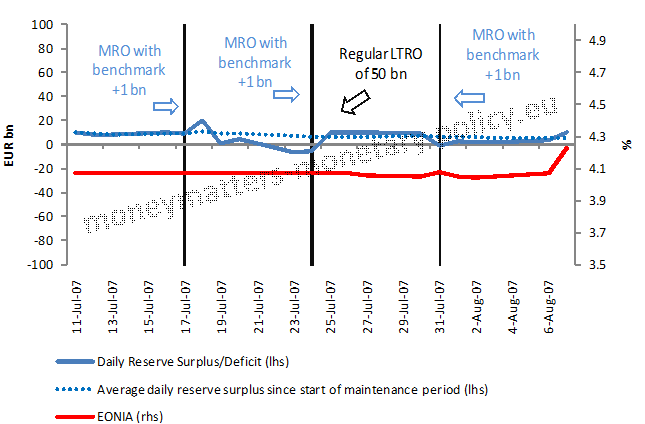 Here we see that, because of the huge amount of liquidity, EONIA moved away from the MRO rate and towards the bottom of the corridor, the Deposit Facility rate. However a closer look shows that it is not easy to take the ebbing and flowing of liquidity as simply a result of the intensity of the crisis. Some of the peaks appear too sharp and sudden to just reflect changes in the crisis intensity. The black vertical bars in chart 6, marking the time when the ECB took particular measures, fundamentally help understanding the changes in excess liquidity. In particular the first peak on October 2008 corresponds to the move to fixed rate-variable quantity tender, which also implied a halving of the relevant rate corridor, as the banks no longer borrowed money under the Marginal Lending Facility as they could borrow as much as they wanted at the lower MRO rate. The second peak, on June 2009, corresponds to the offer of a 1 year long LTRO and, finally, the offer of two 3 year LTROs at the turn of the year 2011 led to another two peaks, indeed practically up to the maximum level mentioned by Draghi in the quote above. 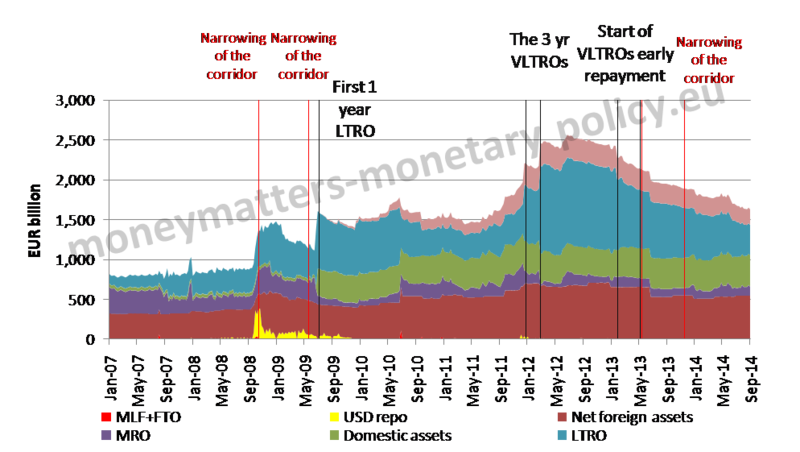 We can refine the understanding of the effect of changes in the modality of ECB funding looking at the red vertical bars, identifying the time when the ECB narrowed the corridor between the MRO and the Deposit Facility rates. Indeed we see that, in the first two cases, the narrowing of the corridor was followed by an increase in the demand of liquidity by banks while apparently the further reductions of the corridor in May and November 2013 were overwhelmed by the behaviour of banks needing less support from the ECB. 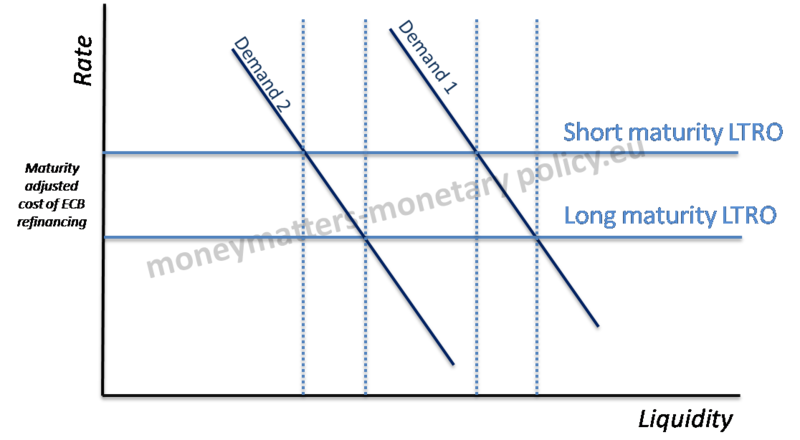 The encompassing way to understand the effect on outstanding liquidity from changes in the modalities of liquidity provision by the ECB is that an increase of the maturity of an LTRO for the same rate of interest or a narrowing of the interest rate corridor can be interpreted as a downward shift of the horizontal supply curve, since they make the cost of central bank funding cheaper. This means that the cost of ECB intermediation matters for the determination of the outstanding amount of liquidity and this depends on the maturity of its operations, for a given MRO rate, but also on what I called in a previous post its “mark-up” or intermediation margin. 5)Central bank profits and multiple equilibria Chart 7 summarizes these considerations. 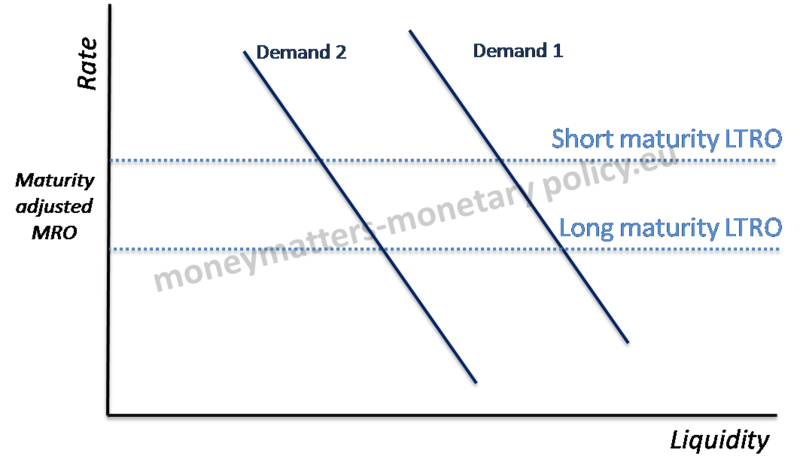 In Chart 7 one sees that liquidity can change either because the ECB lowers the cost of its lending, by offering longer maturities at unchanged MRO rate and reducing the MRO-Deposit Facility rate spread, or because the demand from banks for central bank intermediation changes, following the intensity of the crisis. The amount of liquidity outstanding is thus a mixed indicator of supply by the ECB and demand by banks. So, in conclusion, while now the amount of outstanding liquidity directly depends from banks demand, the ECB has a significant influence on it by moving the cost of its intermediation, in particular by lowering it either lengthening the maturity of its lending or narrowing its intermediation margin. After having looked at the 7 previous charts, the statement of Draghi looks less surprising as the ECB is, after all, capable of influencing outstanding liquidity by reducing the cost of its lending. To translate this pretty general conclusion into something more specific and get a better sense of what the demand for the TLTRO could be, it is interesting to look again, as I did in a previous post, at the cost of the TLTRO compared with that of different ways of borrowing in the market. 6)A fair chance for the European Central Bank In Chart 8 we see that the increase of the maturity of its lending to four years represents a significant reduction of its cost of intermediation relative to market rates: unless banks can borrow at the same cost as the German Treasury or at the Swap rate, it is quite convenient to borrow from the ECB at a 15 bp cost for a 4 year maturity. In conclusion, the analysis presented in this post gives some support to the view put forward by Draghi that the TLTRO could indeed provide the largest contribution in returning the ECB balance sheet to the level it had in June-July 2012. Draghi´s statement remains bold, however, as it is not clear that this contribution will indeed be large enough to reach the stated objective. It seems to me that the commitment by Mario Draghi is even steeper than you suggest in the main text, because, as you quote in footnote 1, he referred to the size of the balance sheet in the “beginning” of 2012, not in June-July 2012. In the very first weeks of 2012 total assets were around 2.7 trillion, and if you accept that week 9-10 are still in the beginning of the year, they amounted to 3 trillion! thank for your comment and sorry for answering so late. The advantage is that your point was demonstrated fully valid by subsequent events.